Home Boardgames Pitch please! Gridiron games you can try at the table! Pitch please! Gridiron games you can try at the table! Are you a Broncos buff? Or a Panthers fan? With Super Bowl 50 fever still upon us, here is (in no particular order) UnGeek’s recommendations for Football-styled games you can try on the table! Time to scratch that grid. With a mix of Rugby and Soccer, Kaosball is a fantasy-sports game (similar to Blood Bowl) that pits 2-4 teams with various player powers and abilities in an every-man-for-himself or team-versus-team king of the hill battle. This game is more of an area-control style with some auction/bidding aspects and hand-management thrown into it. Production and components-wise, just like the other CMON games, the quality is top-notch, especially for the miniatures. For those of you that would like to play Blood Bowl but find the 80+ page rulebook a bit daunting, this game might be for you. 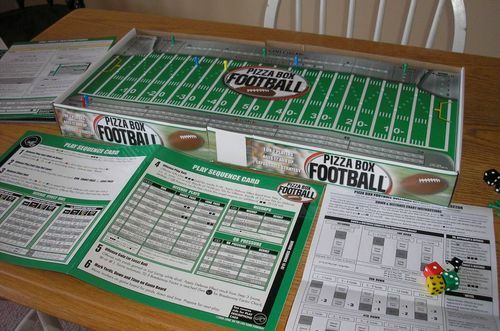 One of the more older games in the list, Pizza Box Football is appropriately named because of the size of the game box in which (you guessed it) is roughly the same size as your average pizza box. It has a neat gimmick where the game box folds out and you have a cardboard insert that fits right into it which serves as your game board (saving much-needed table space). Additionally, the board itself has holes for pegs, suggesting that this could be a game you can bring for travels. The game itself is based on a simultaneous action-selection mechanic where the defending player will try to guess what play (run, short pass, or long pass) the offensive team is doing and keep an appropriate colored die in his hand. Based upon his prediction the team making the play is going to declare the action and the one who is defending will then roll the dice and refer to the player chart for its effect. To put it simply, the better the defending team can predict what type of play his opponent is doing, the more chances that play might be stopped. The game rewards clever decision-making and a bit of luck with the dice. The oldest game on the list, and probably my favorite fantasy sports game of all-time. Blood Bowl is a mix of Games Workshop’s Warhammer Fantasy setting and American Football. Teams are represented by races with different skills and attributes, as they attempt to score higher by reaching the opponent’s end zone with the ball – by any means possible! Playing in a league is probably the best way in experiencing the game where players can fine-tune their teams into any way they like throughout the season. You can make an Orc team that is focused on just beating the heck out of the opposing team (Injuries and deaths are permanent by the way), a tough as nails team like the dwarves, or an Elf-team that is good at passing and dodging. The customization in this game is amazing! 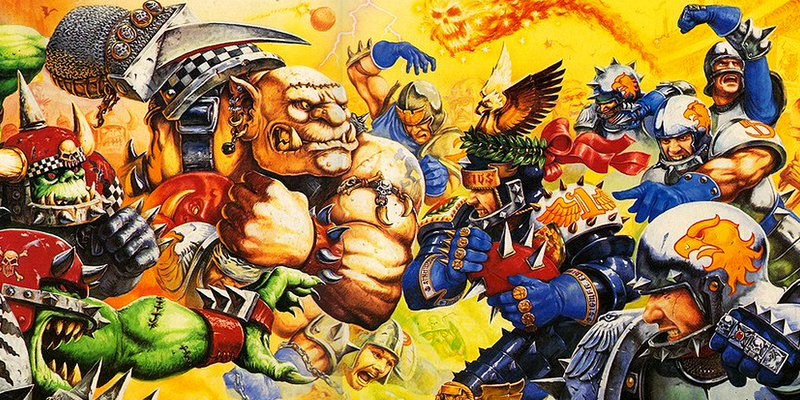 Although I mentioned the game is really old as the 3rd edition was released in 1994 it’s still well-loved by tabletop-fans to this day and it is evidenced by the Blood Bowl: Living Rulebook – currently on its 6th edition. And more importantly, in the recent event Nurnberg ToyFair, the game is scheduled for a new edition in 2017. With that said, and the recent release of the Blood Bowl 2 video game It really is a good time to get into the franchise! For those who want to get that similar Blood Bowl feel but will less time and an easier grasp of the rules, this might be right up your alley. In Blood Bowl: Team Manager, the players manage one of the 12 Blood Bowl teams (if you count all the expansions) as they go through a whole season of play by committing their roster through different matchups or highlights where they can get fans (the goal of the game) or improvements for their team. With that said this game features a deck-building mechanic where we can draft star-players, hire staff and team upgrades. What’s good about this game aside from its simplicity in mechanics and easy to pick-up approach (you just play a card and do what it does), the game also goes up to 5 players! There are also nice variants in the BGG page that simulates league-play just like the miniatures game. You might want to check on this if you have more than 2 players. With a decent amount of playtime, the game doesn’t overstay its welcome. So that’s about it! Are there other games that should have made the list? Give us your thoughts! You may or may not be a football fan, but these are games that you can definitely look into! See you guys at the table! Whats going on? ITS TOYCON 2016!